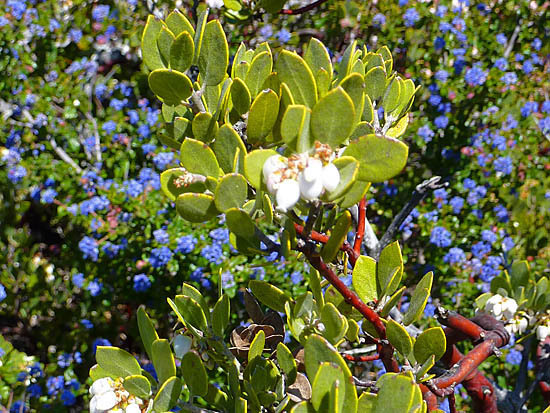 Manzanita - Spanish for 'Little Apple' - is a common name for evergreen shrubs and trees of the genus Arctostaphylos, of the heath family (Ericaceae), native to western North America. Its bark is notably smooth, hard and of a reddish hue (PT.com). The leaves are thick, evergreen, and smooth-edged. The small, urn-shaped flowers are pink or white and are borne in terminal clusters. : Manzanita is a common name for many species of the genus Arctostaphylos. They are evergreen shrubs or small trees present in the chaparral biome of western North America, where they occur from southern British Columbia, Washington to California and New Mexico in the United States, and throughout much of northern and central Mexico. They are characterized by smooth, orange or red bark and stiff, twisting branches.